Just a day after the Save the Cairns Yacht Club campaign website was launched, over 2,000 people have visited the site. You can add your comments below, or on Save the Yacht Club website. The passion for me to write my play 'The Boathouse' came in the form of the Cairns Yacht Club (CYC) building. Or moreover it’s current position on death row. The CYC has been part of Cairns’ history since 1908 and this building has been there since 1920 teaching sailing and welcoming local and international visitors to soak up uninterrupted views and sea breezes. It’s the most historic water-front building in Cairns and undeniably part of this city’s heritage. I am not a keen sailor, quiet the contrary a big swell makes my stomach lurch. Nor was I conceived under the CYC’s verandah (as many Cairns’ locals proudly claim to be), but my passion came because this living, breathing building creates a link from the past to the future. For people with no idea what this city was like before tourism, 747s and besser-bricks arrived, it takes them back to the beginning of a fledgling sea-port and a place of the past. And for those who know it well, the stories and the ambiance continue to deliver to generations of friends and visitors an old building with no pretensions, cheap beer and a great local flavour. To have it demolished for yet more air-conditioned, high-rise apartments is like chopping down the family-tree. The idea is a travesty, and its determined suggestion became the catalyst for my play. In 2006 JUTE & the Darwin Theatre Companies' production of The Boathouse played to audiences in Cairns and Darwin with great success, part of which I believe, was in its ability to touch so many different people with a common thread. People really do care about their history and where they live because it helps define who they are and where they've come from. We need to ensure this building is there for future generations to take that journey too. The Boathouse script is registered with the Australian Script Centre, and the Arts Nexus review. The imminent demolition of Cairns' iconic yacht club building is a travesty. 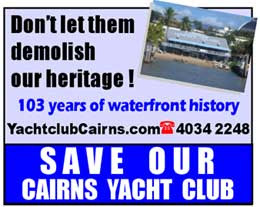 The Cairns Port Authority , state members of parliament, the former Cairns Council and the current committee of the Cairns Yacht Club have been complicit in blatant attempt to destroy this part of Cairns' rich cultural heritage. It is seen as purely a land grab for development and those who have been promoting the demolition of the building and stealing the land from the community have shown an arrogant disregard for many of Cairns' citizens past and present who utilised the facilities for sporting, social and cultural purposes. The previous attempts to register the building with the National Trust were stymied by the former pro-development mayor of Cairns, who together with State MP's, was prepared to turn Cairns' waterfront into a sterile clone of other waterside developments throughout the world. Once your history is destroyed, you lose part of your soul. Cairns is at risk of becoming soulless or at least selling its soul. The new CRC has many supporters for maintaining and upgrading the current facility. New plans should be drawn up to incorporate this renovation into the waterfront masterplan. There needs to be a balance between private development and public facilities; currently there is an over representation of the former at the expense of the latter. We have a unique opportunity to say to the world, "We have a beautiful city, where people count. We welcome you and invite you to enjoy our modern city with its mix of the contemporary and our proudly preserved heritage that celebrates and embraces our rich history and culture". There is a line in the sand. That sand is the beach at the front of the CYC building! MEMORIES OF THE YACHT CLUB! Years ago, my husband, our two son’s and myself set off on Fathers Day to fish in the inlet. Came lunch time, we moored our little tinny on the forefront, walked up to the Yachty, in our fishing gear, (no questions asked, no fancy attire had to be adhered to, our money was as good as the next blokes, our patronage was very welcomed), had a very pleasant Fathers Day family meal together, popped back into the boat and continued to fish for the rest of the beautiful Cairns, September afternoon. NO WHERE ELSE IN THE WORLD COULD YOU DO THAT IN A MAJOR TOURIST CITY. DESLEY, STEVE, ANNA, WHY CAN’T YOU SEE THE VERY REASON FOR IT’S ATTRACTIVENESS IS IT’S OPENNESS, IT’S HONESTY, IT’S TOTAL DISREGARD FOR SNOBBERY AND FINERY. DO NOT DESTROY ONE OF THE LAST BASTIONS OF HISTORY IN THIS MAGNIFICENT CITY. On first arriving in Cairns 1978, the Yacht Club was the centre of social activity & I remember a great New Year's Eve that year, the bagpiper wearing stubbies & thongs! I can't believe the greed of the CPA & Qld Govt which knows no bounds. 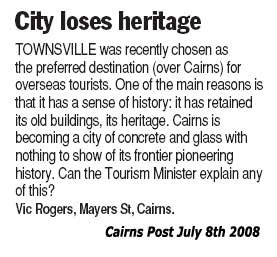 There's no respect for history in Cairns & this is only the most recent event in a long list of appalling destruction of our proud past. Demolition of old Qlanders for ugly unit blocks continues apace & who can forget the lovely Abbott Manor on the Esplanade which was destroyed by fire years ago only for the then Matson Plaza to appear on the site! Maintain the rage folks before it's too late. We are becoming another Gold Coast with no character or soul. It is such a shame that a lovely location is going to be bulldozed! My fiance and I have had many wonderful evenings on the balcony enjoying a lovely meal and the Thursday Night Jazz Sessions, all while over looking a fantastic setting.... locations like this in Cairns are far and few between and we should all be doing our utmost to preserve such an establishment! It seems to me the Cairns Port Authority is undergoing change as it both loses the airport and becomes more regional in its focus on seaport operations. There must be a window of opportunity to negotiate the preservation of heritage, and the achievement of sustainable and aesthetic development along our waterfront. I notice that several people, with leadership from Wendy Richardson, now talk of using Nonviolent Direct Action to challenge any demolition, and swing public opinion behind a better negotiated settlement. Such campaigns are known to be effective, if planned and carried out effectively by people strong enough to pay a penalty for the depth of their conviction in acting against the law. I hope that Wendy and her colleagues take full advantage of their campaign, and make adequate preparation for a clear and compelling program of action. I'm happy to assist any nonviolent group in planning and preparing for nonviolent intervention. You only have to look at the headline pictorial for Cairnsblog (above) of the inlet waterfront to understand how stupid are the arguments from the CPA and their supporting lackeys. Just look at the size of the site compared to the total wharf area! What plans? Obviously waterfront landfill is required in the current beach area for any kind of economic feasibility? I notice that the Cairnsblog logo photo has not been upgraded to include the new Harbour Lights building, the most recent CPA Cityport development. No one in Cairns regards this as anything other than an appalling eyesore, too bulky for the land area, and incongruous with the Cairns ambience. Many of the Yacht Club members do not want to move and want to save the club. Blame the commodore and vice commodore for being part of the problem, but realise the members love the club and want it to stay.